I've been working Bangkok for 3 years. I've been using Cigna Global silver plan (China -> Thailand) for 5 years but it seems like many of the international hospitals don't accept direct billing with them so the few times I went to Bumgrungrad, I had to pay out of pocket. 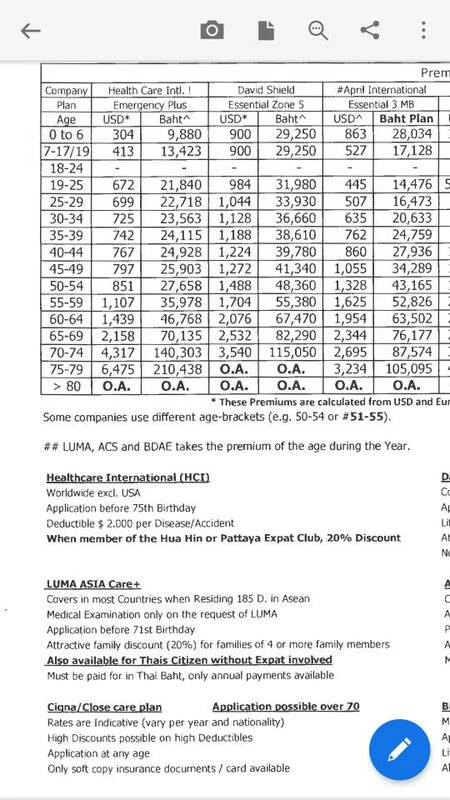 LUMA (Asia Care Plus / Asia Care First) (very responsive and easy to understand plans, 32M annual limit, cancer treatment (both inpatient and outpatient), emergency dental, premium 35-55k/year for plan 1, zone C), relatively young company as I couldn't find many company info nor reviews. Has anyone used any of the above 4 companies, how is it? Please share with us your experience, pros & cons. I do not understand the problem re Cigna Global. They most definitely DO have direct billing arrangements with Bumrungrad and pretty much all other private hospitals in Thailand. Many people, myself included, can attest to this. Are you perhaps referring to outpatient care? For that, you do pay upfront and get reimbursed and this is true of most plans, not just Cigna. Though having outpatient cover for Thailand is usually a waste of money. For inpatient care the hospital has to communicate with Cigna and obtain a Guarantee of Payment (GoP) from them. With this, they will nto bill you but rather the insurance company directly. Same process for all other insurers I know of. Re the options you mention I would personally advise against a Thai-issued policy (which all of these except Cigna seem to be) and stick with international companies. Aside from Cigna, good options are April (April International based in France, not April Thailand) and David Shield. the latter is not so good for older people but has attractive premiums for younger people like yourself. I suggest you contact AA brokers info@aainsure.bet for more detailed information and franker discussions of pros and cons on some of the policies you list than I can do online. Buying through a broker does nto cost more and has the added benefit that they will help out after wards if there are any problems with claims. The main problems with Cigna is that one has to call the UK for everything (or the hospital does), they do nto always respond to emails. And their customer service people are, to be charitable, a bit disorganized, Nothing sinister, just inefficient biordering n ditzy, So it can take a lot of follow up. April has an office in Thailand and even when the policy is issued out of France their Thai office will handle pre-approvals etc so communication much easier. Cigna, April and David Shield will nto raise premiums on an individual basis due to claims history or change in health status and they are governed by UK or French insurance regulations with clear avenues for complaints and disputes. Most Thai issued oplicys WILL increase premiums based on claim history and so can effectively pricey ou out despite a guarantee of lifetime cover, this is a very big concern. Some also engage in dodgy efforts to deny claims on pretty flimsy grounds, The health insurance market in Thailand is small (since Thais have no need of it) and in general not as experienced/professional as longstanding international firms. The main problems with Cigna is that one has to call the UK for everything (or the hospital does), they do nto always respond to emails. And their customer service people are, to be charitable, a bit disorganized, Nothing sinister, just inefficient biordering n ditzy, So it can take a lot of follow up. The sales people are an entirely different group from those who manage policies. Aggressive calling is typical of not just Cigna but most insurance companies. I always advise people not to give their phone number when requesting an insurance quote online. If the phone number field is mandatory enter a string of zeros or nines. How much are your yearly bills? I asked, because I am interested in the individual increase after claims? I read in the contract, when you use more than 200% of the yearly insurance premium, then they "can" increase. Thank you all for your inputs! and thank you especially to Sheryl for very detailed reply. And maybe contrast to what I thought, I was only covered for inpatient with Cigna and that's why I couldn't use it. (silly me) However, like you said, it seems like adding on outpatient coverage for such high premium in Thailand, does seem like waste of money. I will look into April International as it sounds like it has more presence in Thailand and the rest of the world, thus easier to communicate than Cigna. I am with April , they have office in Bkk. Premiums are not the cheapest but really high coverage. Had a surgery , they paid directly with the hospital. Called to confirm and called to follow up after the surgery . Yes, I changed from Cigna to April for exactly this reason. Make sure you get the international policy from April global and not the My Health Thailand policy. You can get through AA brokers. What's wrong with the April my Thailand if it's for living in Thailand? Be advised, if you go with April International ' Essential' policy which I suspect most will the hospitalisation is based on a twin room. For accidents and emergencies they will cover the cost of a private room in the absence of a twin room. For 'scheduled hospitalisation' they will NOT cover a private room. At all. May I ask when you joined April [ was that April International ] and if so was it the 'Essential' policy. ?